Young man, inquired Mother Teresa, do you say the rosary often? No, not really, he admitted. She took his hand, while her eyes probed his. Then she smiled. Well, you will now. And she dropped her rosary into his palm. Jim Castle was tired when he boarded his plane in Cincinnati, Ohio, that night in 1981. The 45-year-old management consultant had put on a week-long series of business meetings and seminars, and now he sank gratefully into his seat ready for the flight home to Kansas City, Kansas. As more passengers entered, the place hummed with conversation, mixed with the sound of bags being stowed. Then, suddenly, people fell silent. The quiet moved slowly up the aisle like an invisible wake behind a boat. Jim craned his head to see what was happening, and his mouth dropped open. Walking up the aisle were two nuns clad in simple white habits bordered in blue. He recognized the familiar face of one at once, the wrinkled skin, the eyes warmly intent. This was a face he'd seen in newscasts and on the cover of TIME. The two nuns halted, and Jim realized that his seat companion was going to be Mother Teresa. As the last few passengers settled in, Mother Teresa and her companion pulled out rosaries. Each decade of the beads was a different color, Jim noticed. The decades represented various areas of the world, Mother Teresa told him later, and added, "I pray for the poor and dying on each continent." The airplane taxied to the runway, and the two women began to pray, their voices a low murmur. Though Jim considered himself not a very religious Catholic who went to church mostly out of habit, inexplicably he found himself joining in. By the time they murmured the final prayer, the plane had reached cruising altitude. Mother Teresa turned toward him. For the first time in his life, Jim understood what people meant when they spoke of a person possessing an "aura." As she gazed at him, a sense of peace filled him; he could no more see it than he could see the wind, but he felt it, just as surely as he felt a warm summer breeze. "Young man," she inquired, "do you say the rosary often?" "No, not really," he admitted. She took his hand, while her eyes probed his. Then she smiled. "Well, you will now." And she dropped her rosary into his palm. An hour later Jim entered the Kansas City airport, where he was met by his wife, Ruth. "What in the world?" Ruth asked when she noticed the rosary in his hand. They kissed and Jim described his encounter. Driving home, he said. "I feel as if I met a true sister of God." Nine months later Jim and Ruth visited Connie, a friend of theirs for several years. Connie confessed that she'd been told she had ovarian cancer. "The doctor says it's a tough case," said Connie, "but I'm going to fight it. I won't give up." Jim clasped her hand. 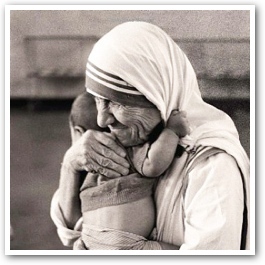 Then, after reaching into his pocket, he gently twined Mother Teresa's rosary around her fingers. He told her the story and said, "Keep it with you Connie. It may help." "Although Connie wasn't Catholic, her hand closed willingly around the small plastic beads. "Thank you," she whispered. "I hope I can return it." More than a year passed before Jim saw Connie again. This time, face glowing, she hurried toward him and handed him the rosary "I carried it with me all year," she said. "I've had surgery and have been on chemotherapy, too. Last month, the doctors did second-look surgery, and the tumor's gone. Completely!" Her eyes met Jim's. "I knew it was time to give the rosary back." In the fall of 1987, Ruth's sister, Liz, fell into a deep depression after her divorce. She asked Jim if she could borrow the rosary, and when he sent it, she hung it over her bedpost in a small velvet bag. "At night I held on to it, just physically held on. I was so lonely and afraid," she says, "yet when I gripped that rosary, I felt as if I held a loving hand." Gradually, Liz pulled her life together, and she mailed the rosary back. "Someone else may need it," she said. Then one night in 1988, a stranger telephoned Ruth. She'd heard about the rosary from a neighbor and asked if she could borrow it to take to the hospital where her mother lay in a coma. The family hoped the rosary might help their mother die peacefully. A few days later, the woman returned the beads. "The nurses told me a coma patient can still hear," she said, "so I explained to my mother that I had Mother Teresa's rosary and that when I gave it to her she could let go; it would be all right. Then I put the rosary in her hand. Right away, we saw her face relax! The lines smoothed out until she looked so peaceful, so young." The woman's voice caught. "A few minutes later she was gone." Fervently, she gripped Ruth's hands. "Thank you." Is there special power in those humble beads? Or is the power of the human spirit simply renewed in each person who borrows the rosary? Jim only knows that requests continue to come often unexpectedly. He always responds though whenever he lends the rosary. He says, "When you're through needing it, send it back. Someone else may need it." Jim's own life has changed, too, since his unexpected meeting on the airplane. When he realized Mother Teresa carries everything she owns in a small bag, he made an effort to simplify his own life. "I try to remember what really counts-not money or titles or possessions, but the way we love others," he says. The original source of this story is not known.